On December 20, 2018, 19 Senators signed a letter to Federal banking agencies regarding the proposed rulemaking on reduced reporting for covered depository institutions. Section 205 of the Economic Growth, Regulatory Relief, and Consumer Protection Act of 2018 (S. 2155), entitled “Short Form Call Reports. On behalf of community bankers in Georgia, thank you to Senators Johnny Isakson and David Perdue for signing on to this letter. The Senators urged the federal regulators to revisit the notice of proposed rulemaking for implementation of Section 205 to provide much more significant call report relief for eligible community banks. For the typical well-capitalized and well-managed community bank, this proposal would have little or no impact on lessening the reporting burden to the degree intended by Congress. The Senators requested that regulators provide much more significant reductions in the reporting burden for community banks in the first and third quarters while continuing to receive the robust reports of condition and complete financial statements already being provided during the second and fourth quarters. 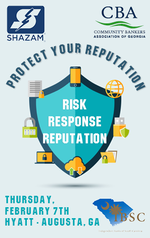 CBA member banks are encouraged to tell agencies to heed Congress and reduce the Call Report. The deadline for the comments is January 18th. Separate messages can be found from ICBA for banks less than $1 Billion and banks greater than $1 billion. 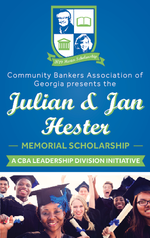 CBA’s Leadership Division’s goal is to grow the Julian & Jan Hester Memorial Scholarship Program to all CBA member banks. We feel strongly it can be done. In order to accomplish this, we must first inform our banks how the program works and how each bank and its branches can easily offer the scholarship within their communities. The Scholarship Committee (a sub-committee of CBA’s Leadership Division) is hosting a complimentary educational webinar directed to those in the bank who will oversee the scholarship program. The webinar is scheduled for Thursday, January 17, 2019, at 10:00 am, Eastern. The webinar details will be emailed to all registrants prior to the event date. Please ask the appropriate person within your bank to email Peake Wilson to register for the free webinar. Scholarship FAQs are now included on our website. Please click here to learn more and to download the application. 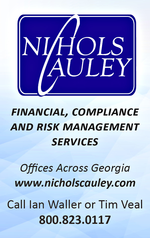 For additional information, please contact Peake Wilson in the CBA office – peake@cbaofga.com or (770) 541-0379. Join the 2019 Compliance Program! The CBA’s Compliance Program is a specially-designed program to educate community bankers on federal regulatory issues and the applicable effects on their bank. New regulations and the interpretation and application of existing regulations will be addressed in a straightforward manner. 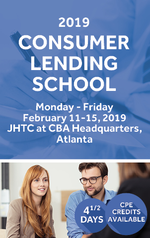 During 2019, the CBA will offer four compliance programs in one-day formats in five cities during the months of March, May, September/October and December. To learn more about this one-of-a-kind cost-saving compliance program designed specifically for community banks, click here for the 2019 Compliance Program Membership brochure. Join the 2019 Compliance Program now in time for the first quarter Compliance Program I, "TRID: Facing the Challenges." To learn more and register for Compliance Program I, click here.​ For questions or assistance, please contact the CBA Education Department. Banking is a risk management business. Most of the time that risk is framed in business terms like liquidity, loan quality or rate risk. But three risks with the potential to cripple your bank every day often don’t get as much attention: cybersecurity, robbery and the risk they represent to your bank’s long-term reputation. Join us on Thursday, February 7th for a full-day training that will break down best practices for securing your data, providing simple steps to reduce risk inside your bank and deliver the tools to prepare you for a worst case scenario so your reputation survives intact. CBA and the Independent Banks of South Carolina are collaborating and would like to invite you to learn from our endorsed member, SHAZAM. Protect Your Reputation will give you a comprehensive look at how to meet the rising threats in the physical and virtual world your banks occupy. 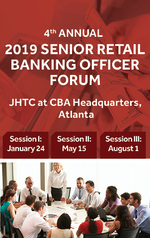 You will leave armed with the latest trends, best practices and long-term strategies your bank can employ to mitigate risk, build a robust response and protect your reputation. Learn more and register. Disaster assistance is now available for eligible Georgia farmers affected by Hurricane Michael with funds allocated during the special legislative session convened by Gov. Nathan Deal last month. Farmers eligible for assistance must be suffering a loss to their income as a result of Hurricane Michael. The Georgia Development Authority will administer a $55 million loan program provided through the Fiscal Year 2019 Appropriation Act, which was amended to provide emergency funding for state agencies and local governments in areas heavily impacted by the storm. The purpose of the program is to provide relief to Georgia farmers through the SAFETY 21 Loan Program. These funds are meant to bridge the gap for approved applicants until other disaster relief and insurance funds are available. Read more. The Community Bankers Association of Georgia (CBA) and ACG are marking the 15th anniversary of ACG as an Endorsed Member Company. Headquartered in Alpharetta, ACG, is a global leader in the refurbishment of ATMs and the supply of ATM parts to ATM service companies. In addition to ATM refurbishment, ACG’s product portfolio includes spare ATM part solutions, anti-skimming protection solutions, repair, compliance solutions, and more! “We are pleased to partner with ACG for ATM refurbishment as well anti-skimming protection devices," stated John McNair, President & CEO of Community Bankers Association of Georgia. “Working with ACG offers CBA member banks significant savings on refurbished ATMs plus they have a portfolio of Anti-Skimming solutions to prevent card skimming.” Read the press release. The IRS announced it will begin processing requests for transcript information made through the Income Verification Express Service program earlier this week. The agency, which remains closed during the partial government shutdown, warned of potential delays as employees are brought back to work and begin to process backlogged requests since the funding lapse on December 22, 2018. ​In its quarterly newsletter, the FDIC published a table that chronologically lists some of the regulations, exam procedures, and other information that became effective in 2018, as well as several upcoming changes that become effective in 2019. 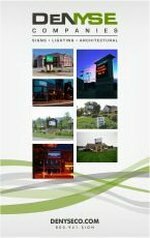 These include updates regarding HMDA, CRA, EGRRCPA, and much more. The table provides a brief summary for each item, hyperlinks to applicable reference documents, and the effective date of each change. The table is based on information available at the time of publication. Are you ready to do your HMDA reporting? 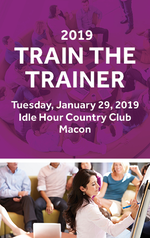 We can help – plan to register and attend our one-day Mastering HMDA workshop on Wednesday February 13, 2019 in Macon. Learn more and register. The Bureau of Consumer Financial Protection issued final policy guidance outlining modifications it will apply to loan-level data reported under the Home Mortgage Data Act and Regulation C to protect applicant and borrower privacy. The guidance applies to HMDA data compiled by financial institutions beginning in or after 2018 and made available to the public in 2019. The bureau will commence a rulemaking this spring to identify more definitive data modifications under the balancing test and incorporate these modifications into a legislative rule. Read the guidance. In addition, the Bureau announced community banks can now access the HMDA platform to begin the filing process for data collected in 2018. The Bureau extended an opportunity for banks to familiarize themselves with the HMDA filing platform in a previous beta version. Access the platform. Lessees will be required to recognize assets and liabilities on the balance sheet for the rights and obligations created by all lease terms of more than 12 months, under an accounting standard update announced in February 2016. The standard becomes effective for public companies with fiscal years (and interim periods within those years) beginning after December 15, 2018. The standard becomes effective for all other organizations with fiscal years beginning after December 15, 2019, and interim periods beginning after December 15, 2020. Read more in GA DBF bulletin. Make sure your registered for CBA's webinar "Strategic Decisions Regarding CECL Methodologies, Processes & Governance" held Thursday, March 7, 2019. Register here. The federal bank regulatory agencies approved a final rule modifying their regulatory capital rules and providing an option to phase in over a period of three years the day-one regulatory capital effects of the update to the accounting standard known as the "Current Expected Credit Losses" (CECL) methodology. The final rule also revises the agencies' other rules to reflect the update to the accounting standards. In June 2016, the Financial Accounting Standards Board issued an update to the accounting standards for credit losses that included the CECL methodology, which replaces the existing incurred loss methodology for certain financial assets. During the phase in, the agencies will continue to monitor the impact of CECL adoption. The final rule will take effect April 1, 2019. Banking organizations that choose to early adopt CECL may elect to adopt the rule as of the first quarter 2019. Read the final rule. The Financial Crimes Enforcement Network (FinCEN) is inviting nominations for membership on the Bank Secrecy Act Advisory Group (BSAAG). BSAAG membership is open to financial institutions subject to the Bank Secrecy Act (BSA), trade groups with members that are subject to the BSA, and non-federal regulators and law enforcement agencies. Membership is granted to organizations, not to individuals. Organizational members will be selected to serve a three-year term. ​Read the notice for more on the nomination process. Save the Date: Advanced BSA Officer School, Tuesday-Friday, August 6-9, 2019 at the King and Prince, St. Simons. Five federal financial regulatory agencies recently invited public comment on a proposal that would exclude certain community banks from the Volcker rule, consistent with the Economic Growth, Regulatory Relief, and Consumer Protection Act (EGRRCPA). The Volcker Rule generally restricts banking entities from engaging in proprietary trading and from owning or sponsoring hedge funds or private equity funds. The agencies are jointly proposing to exclude community banks with $10 billion or less in total consolidated assets and total trading assets and liabilities of 5 percent or less of total consolidated assets from the restrictions of the Volcker Rule. Read proposed rules. Federal regulators issued final rules adopting interim final rules issued in August expanding eligibility for the 18-month examination cycle. As authorized by the S. 2155 relief law, the agencies raised the qualifying asset threshold for the 18-month exam cycle from $1 billion to $3 billion. Read more. Bill Gates famously said, "Content is King!" 20-years later the king still reigns supreme, but community financial institutions struggle to consistently produce engaging content for social media. Scan a community financial institution's social media feed and you'll see posts about branch closures, holidays, and product information. We think content must be limited to facts about our institution. Boring facts. What if we changed the rules? What if we posted not as a banker, but as if we were the local tourism board? One financial institution has embraced this strategy with tremendous success. Kasasa took a moment to sit down with their content creators to understand the steps they took to leverage social media and their community to revitalize their brand. Read the full article. Guest article from CBA Endorsed Member Company Kasasa. The January issue of Independent Banker magazine gets a jump on 2019 with the results of its inaugural Community Bank CEO Outlook survey. The cover story offers a glimpse of respondents’ to-do lists for the new year, from increasing deposits to tackling digital marketing. The latest edition also includes articles on contactless payments, visiting business borrowers’ sites, 2019 compliance changes, and more. Read more in Independent Banker. 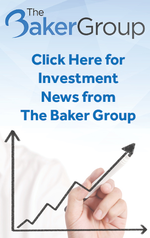 The Baker Group, a CBA Endorsed Member Company, is hosting a complimentary webinar on investment strategies for the 1st quarter. Reg relief makes most reciprocal deposits nonbrokered, providing banks the opportunity to attract even more deposits. Thanks to the newly signed regulatory relief bill, most reciprocal deposits are no longer brokered. This comes as banks face intense and increasing competition for deposits. Join Promontory Interfinancial Network for a free webinar that outlines key provisions of the new law and the impact ICS®, or Insured Cash Sweep®, and CDARS® can have on banks’ balance sheets. Also register for upcoming webinars on how to market and manage ICS and CDARS operations. Learn more and register for these webinars. Congratulations to Eddie Davis, director of Bank of Dudley, Dublin, who retired from the Board of Directors in December 2018 after 50 years of service. “Bank of Dudley would not be here without Eddie Davis,” said Chairwoman Beth Vaughn. President and CEO Sam Beall added, “Most people listen when Eddie talks. He’s sharp as a tack, has a great sense of humor and wit, and was steady in rocky times.” Read more. In addition, congratulations to J. Michael Tate, CEO of Bank of Dade, Trenton, who retired at the end of 2018 after 43 years of service to the industry and to his local community. For the holiday season, Capital Bank, Fort Oglethorpe, was able to raise almost $5,200 to provide Christmas for 30 children in the Catoosa & Walker County area. The bank purchased coats, clothes, pajama’s, and four toy gifts for each child; a bed/mattress for a family; and 2 laptops and 5 tablets. 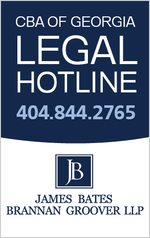 CBA Associate Member Mauldin & Jenkins, Atlanta, has recently announced several promotions effective January 1st. At the Albany office, Emily Dent has been promoted to Director; and Tom Flournoy and Cam Williams have been promoted to Staff II. In Macon, Megan Mangrum has been promoted to Manager; Sarah Higginbotham and Kellan Shuford have been promoted to Supervisors; Tanner Smith has been promoted to Senior; and Matt McCommon and Davey King have been promoted to Staff II. In Atlanta, Justin Davis and Katie Smith have been promoted to Managers; and Matt Orr has been promoted to Staff II. The firm also recently welcomed some new hires: Grace Hoffman, Brittany Tatum, Bob Farrington, Peyton Moore, Jake Herndon, Kevin Strothman, Brandon Waltz, Alex Nguyen, Anna Olsen, Kelsey Goran, Jake Mims, Maggie DuVall, Michael Bragano, Emily Rector and Justin Short. Read more about the new hires. Shannon Henry has been promoted to President and CEO. David Thompson has joined the bank as Senior Commercial Portfolio Manager. Ellis Tucker has joined the bank as Branch Manager and Banking Officer. Andre Kuhn has joined as a Mortgage Consultant. Jeff Sands has joined as Senior Vice President, Georgia Region Lending. W. Collins Brown has been named Partner. Corrie Hall has been named Partner. Heather Hestley has been named Partner. Ross Schell has been named Partner. Brendan Thomas has been named Partner.